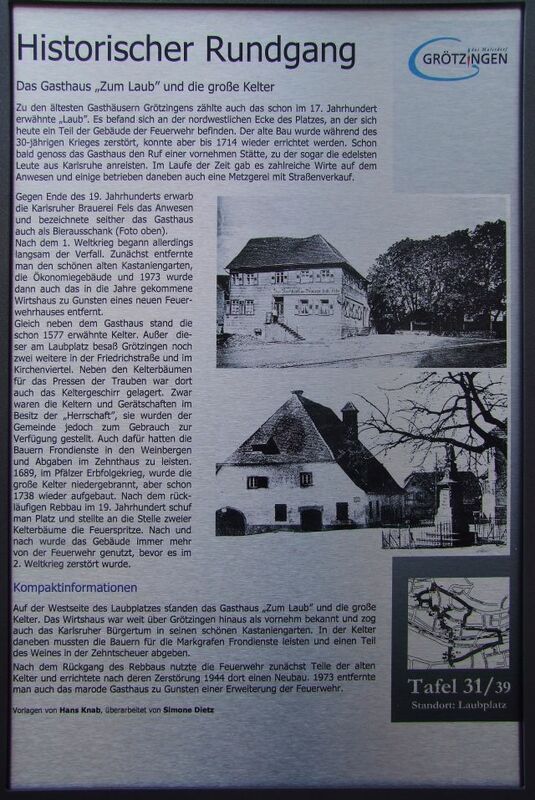 One of the oldest inns Grötzingens also scored in the 17th century mentioned the "leaves". It was located on the northwest corner of the square, on which today are part of the building of the fire department. The old building was destroyed during the 30 Years War, but could be built up again in 1714. Soon enjoyed the inn's reputation of a distinguished place to which even the noblest people in Karlsruhe arrived. Over time there have been numerous hosts on the estate and some operated next to a butcher shop with street vending. Towards the end of the 19th century acquired the Karlsruhe Brewery Rock the property and designated since the inn as beer (photo above). After the first world war, however, began to slowly decay. First, we removed the fine old chestnut trees, the farm buildings and 1973 then the getting on in years the inn has been removed in favor of a new fire station. Right next to the guest house was already mentioned in 1577 winepress. Except this place on the foliage had Grötzingen two more in the Friedrichstrasse and quarter of the church. In addition to the wine trees for the pressing of the grapes and the wine was stored dishes there. Although the vats and equipment in the possession of the "rule" were, but they were made ? ?available for use of the community. Also for the peasants had to pay labor services in the vineyards and charges in the tenth house. 1689, in the Palatinate War of Succession, the great winepress was burned, but already in 1738 rebuilt. After declining viticulture in the 19th century, created space and put in place of two wine trees, the fire engine. Gradually, the building was used more and more by the fire before it was destroyed in the second world war.